KABUL, Afghanistan (CNN) -- From students to conquerors, the Taliban Islamic militia have come a long way, and fast. In just two years, the Taliban have captured more than two-thirds of Afghanistan from the Mujahedeen warriors who had fought Soviet occupation. The Taliban's success has much to do with the unpopularity of the Mujahedeen in recent years. The Taliban emerged as a reformist force -- honest, fierce and devoutly Islamic. Most had gone as refugees to Pakistan, where they studied in the religious schools. The Taliban are widely alleged to be the creation of Pakistan's military intelligence. Experts say that explains the Taliban's swift military successes. They emerged as the new rulers of this war-ravaged nation when they captured the Afghan capital, Kabul, last month. Kabul is important because of its strategic location. It is the gateway to the Indian subcontinent to the south and to central Asian republics to the north. Through history, many groups have invaded Kabul, and the latest conquerors, the Taliban, are set to leave their stamp on the city by imposing a fundamentalist regime guided by their own interpretation of Islamic law. 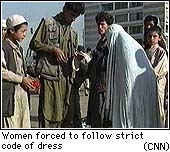 They decree amputations and executions for criminals, and impose severe restrictions on women. They also have banned television, which they see as a symbol of Western decadence. Not much is known about the 35-year-old founder of the Taliban, Mullah Mohammad Umar, a cleric who fought as a Mujahedeen. But his political aims are clear: He is determined to create his version of an Islamic Afghanistan.